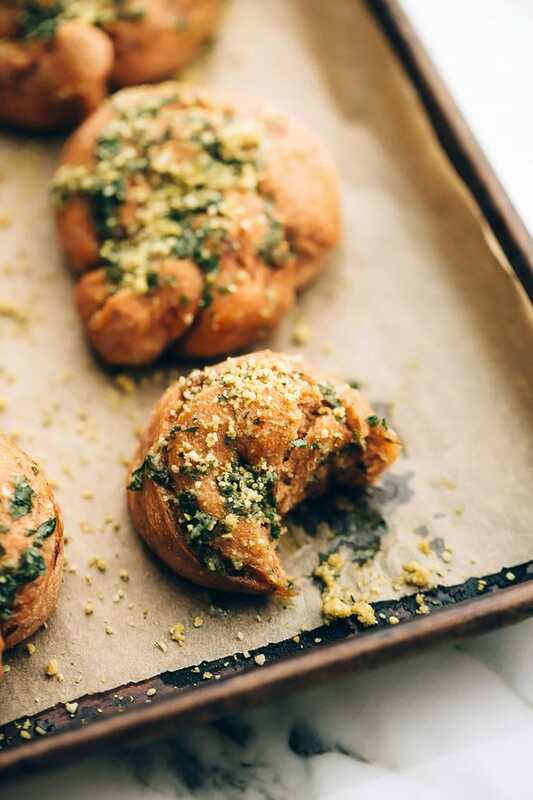 These vegan sundried tomato parmesan garlic knots are soft, pillowy, and comforting. 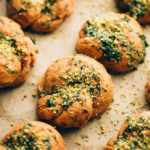 They bake up warm and puffy, and their knotted exteriors are slathered with garlic-infused, parsley-flecked olive oil and sprinkled with pine nut parmesan. 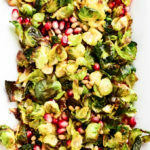 Serve these alongside a festive holiday meal! This post is sponsored by Alessi. Thank you for supporting the brands that support Blissful Basil. 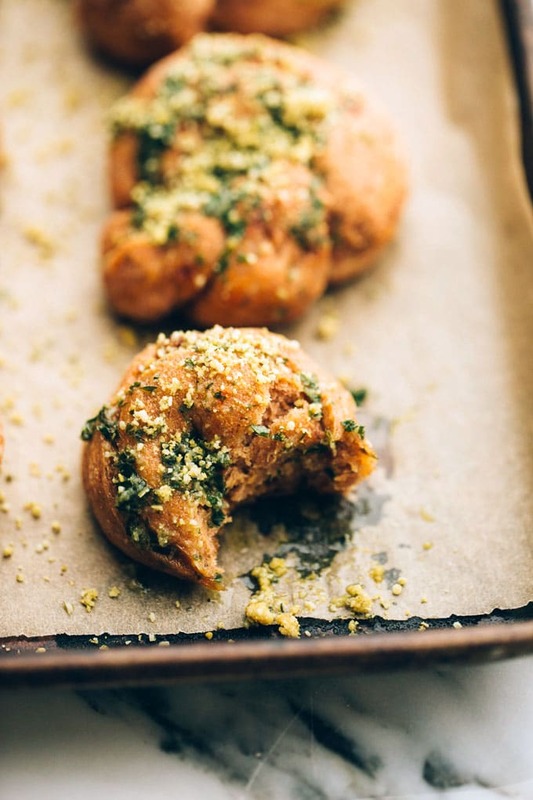 When I shared these sweet potato garlic knots with you back in March, I thought they’d forever remain at the tippy top of my favorite homemade rolls recipe list. And although those garlic knots still rank high, these vegan sundried tomato parmesan garlic knots have knocked them back a notch. These irresistible rolls are soft, pillowy, packed with zesty flavor, and a touch more rustic than their sweet potato predecessors. If you’re able to eat just one, you have far more self-control than I do—when faced with a freshly baked batch, I can’t seem to get out of the kitchen without consuming a bare minimum of two (usually three). 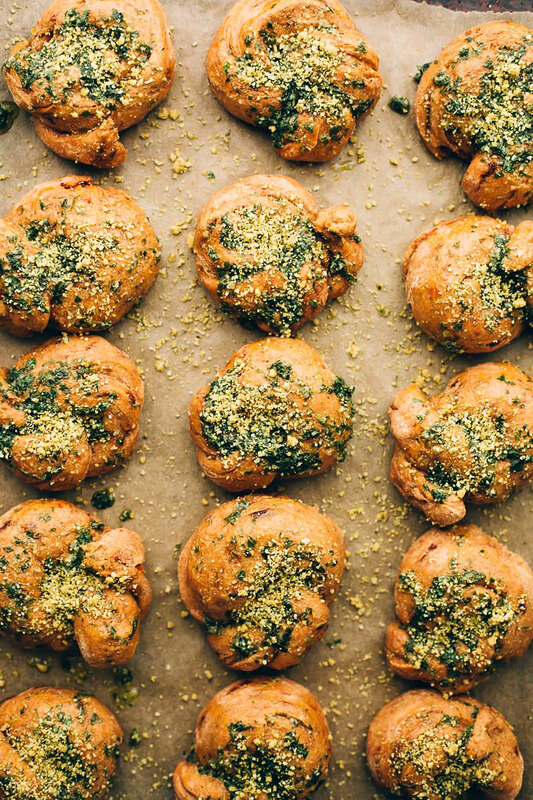 Thanks to their red-and-green look and comforting nature, these vegan garlic knots pair perfectly with a festive holiday feast. Other than the patience required to wait out a bit of potato steam time and inactive rise time, they require little in the way of effort. Plus, the ingredients are easy to come by and you’re likely to have several already on hand. To make these vegan sundried tomato parmesan garlic knots, you’ll start by steaming 1 1/4 cups of peeled and diced russet potato. 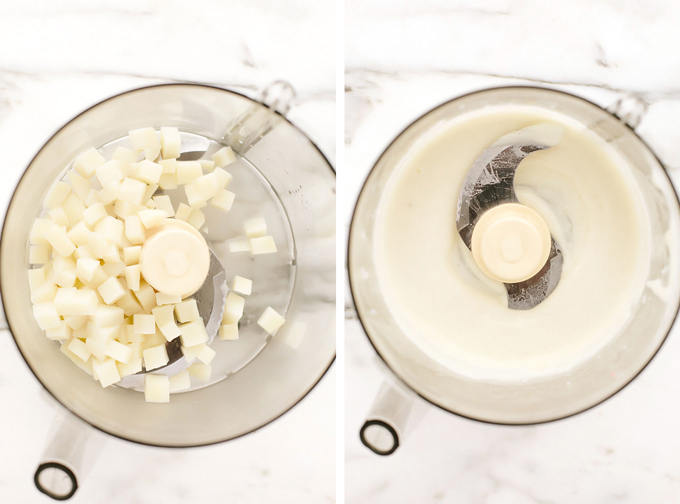 Once the potato is fork-tender, transfer it to a food processor and purée until smooth. Meanwhile, whisk together warm water, a touch of pure maple syrup, and yeast in a small bowl. Let the mixture stand for five minutes, or until a foam develops across the surface. Then, add it to the food processor along with a few cups of whole spelt flour, chopped Alessi Sun Dried Tomatoes, olive oil, dried thyme, and a bit of sea salt. Pulse several times and then process for 15 seconds, or until the dough pulls together in a ball on one side of the food processor. 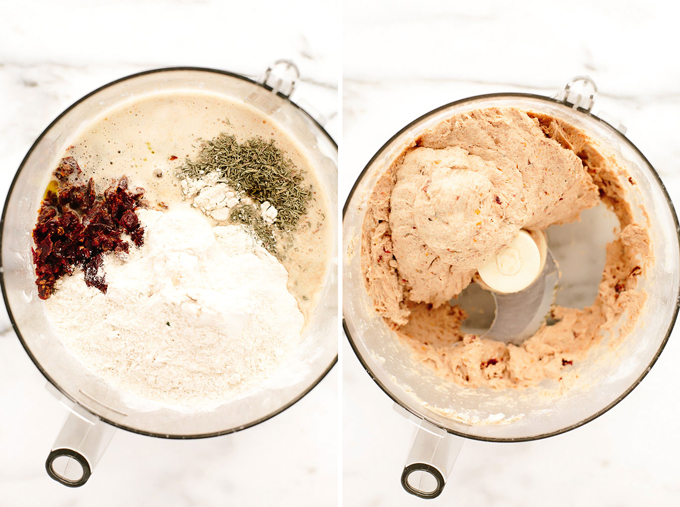 Pull the dough out of the food processor and turn it out on a clean, generously floured work surface. Knead the dough for just 2 to 2 1/2 minutes, or until it’s smooth and springy. The gluten structure in spelt is fragile, which means it requires less kneading. Read: less work! Just be careful not to over-knead, or you’ll end up with dry, crumbly garlic knots. 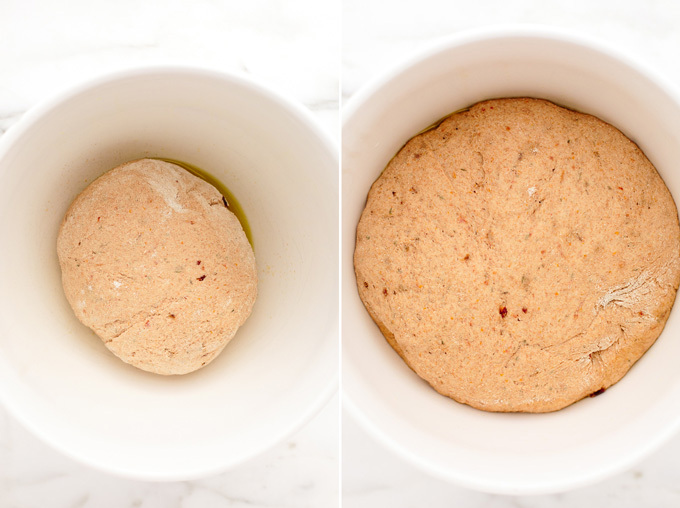 Place the dough in a well-oiled bowl, loosely cover with a kitchen towel, and allow it to rise in a warm and cozy place (e.g., near the oven) for one hour, or until doubled in size. Once the dough has doubled in size, punch it down, turn it out onto a clean, flour-dusted work surface, and divide it into three equal pieces. One at a time, roll each piece of dough into a rectangle and cut into five strips. Then, roll each strip of dough into a rope, gently tie in a knot, and transfer to a lined baking sheet. Repeat. See this post for a visual. Once the knots have been formed, brush their tops with olive oil, loosely cover with parchment paper, and allow them to rise in a warm spot for 30 minutes, or until doubled in size. Bake the knots for 10 to 12 minutes, or until they have golden bottoms and feel well set to the touch. Meanwhile, prepare the garlic-parsley oil and the pine nut parmesan. 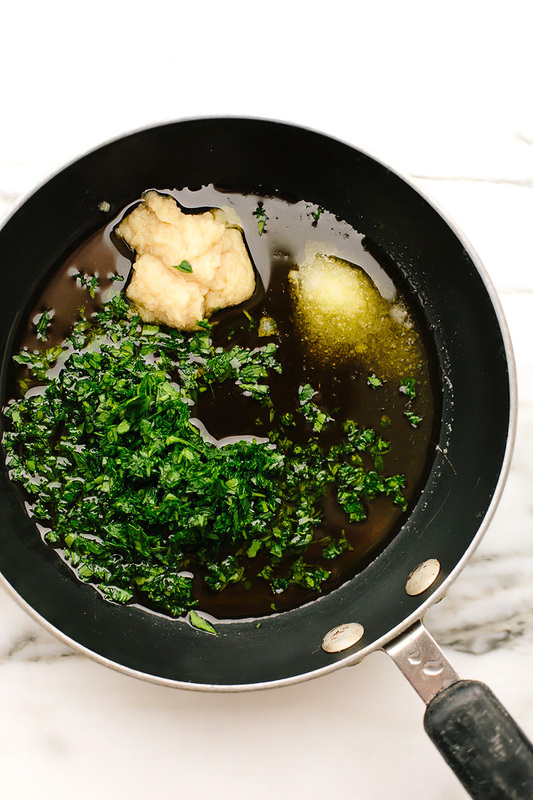 To make the oil, add a bit of olive oil to a small sauté pan along with a tablespoon of Alessi Garlic Puree, a handful of minced parsley, and a generous pinch of sea salt. Heat over low for a few minutes, or until the garlic mellows and softens. Next, make the pine nut parmesan. 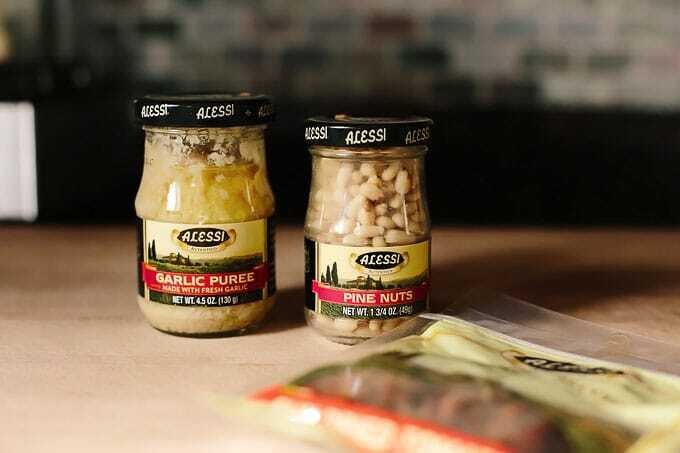 Add one jar of Alessi Pine Nuts to a small food processor along with nutritional yeast flakes and a pinch of sea salt. Pulse several times, or until the mixture resembles coarsely ground parmesan cheese. 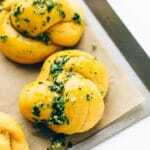 Once the knots are baked, brush them with the garlic-parsley oil and sprinkle with the parmesan. These vegan sundried tomato parmesan garlic knots are best served fresh from the oven, but can be refrigerated or frozen and reheated, too. I hope you enjoy them as much as I do and that they bring an extra dose of coziness and cheer to you this holiday season! The potato needs to be measured precisely, so either go by weight or ensure you have exactly 1 1/4 cups of small-cubed potato. 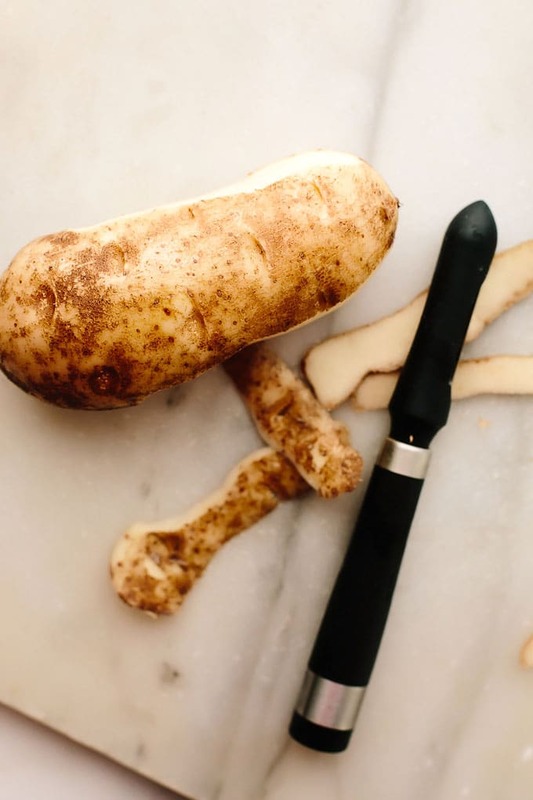 Steam the diced potato in a steamer or steamer basket for 30 minutes, or until fall-apart tender. (Do not steam in the microwave, because it will dry out the potato out rather than infusing it with moisture.) Add the steamed potato to a food processor and process for 1 minute, or until puréed, stopping to scrape down the sides as needed. In a small bowl, gently whisk together the warm water, maple syrup, and yeast. Let stand for 5 minutes, or until a foam develops on the surface. Meanwhile, lightly grease a large glass mixing bowl with olive oil. 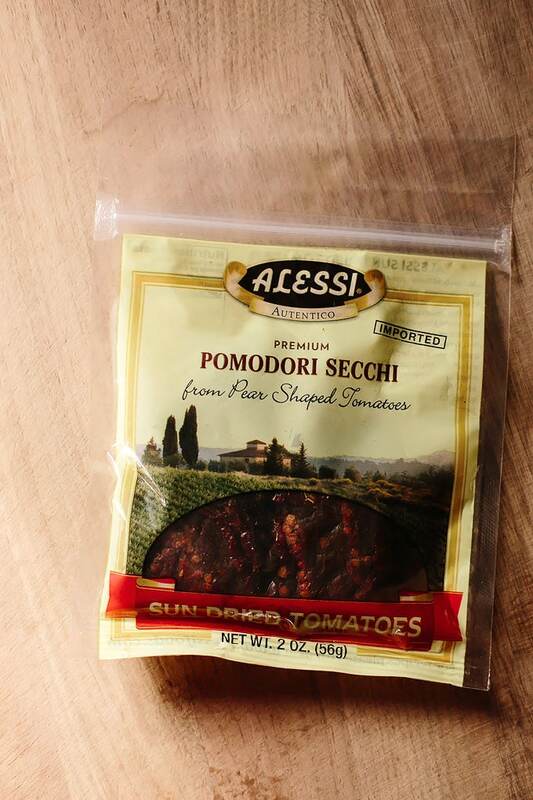 Add the yeast mixture, plus the spelt flour, sun-dried tomatoes, 1 tablespoon of the olive oil, thyme, and 3/4 teaspoon of the sea salt to the potato purée in the food processor. Pulse five 5 times, and then process for 15 seconds, or until the dough begins to roll into a loosely formed ball. 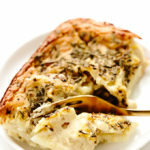 The dough should be soft, sticky, and slightly shaggy, and pulled together in a soft ball on the side of the food processor. If it's too loose or too wet, add more spelt flour, 1/4 cup at a time, and pulse until the desired texture is reached. Alternatively, if it’ is too dry or dense, add more warm water, 2 tablespoons at a time, and pulse until the desired texture is reached. Pull the dough from the food processor and turn out onto a clean work surface that has been generously dusted with spelt flour. Knead for 1 1/2 to 2–2 1/2 minutes, or until the dough is smooth and springy, adding more spelt flour as needed (I usually add about another 1/4 cup). You’ll know the dough is ready when it begins to hold its shape and springs back, slightly but not completely, when pressed. The gluten in spelt is delicate, so be careful not to over-knead or you’ll end up with dry, crumbly rolls. When the dough has just a few minutes left to rise, line a baking sheet with parchment paper. Punch down the dough and turn it out onto a clean, generously floured work surface. Divide into 3 equal pieces, knead for just a few seconds, and roll each piece out into a rectangle that's approximately 5 inches wide by 10 inches long. Slice each rectangle widthwise into 2-inch-thick strips (you want about 5 strips per rectangle). One at a time, roll each piece into a rope, dusting any sticky bits with flour, and gently tie it in a knot, tucking in any loose ends. Place on the lined pan and repeat. Lightly brush the tops of the knots with olive oil and loosely cover with parchment paper or plastic wrap. Let the knots rise in a warm place for another 30 minutes, or until doubled in size. Bake on the middle rack of the oven for 10 to 12 minutes, or until just beginning to turn golden on top. They should feel firm to the touch and have a hollow sound when gently tapped. Transfer the pan to an oven-safe cooling rack and cool for five minutes. Meanwhile, heat the remaining 4 tablespoons olive oil (i.e., 1/4 cup), plus the garlic, parsley, and remaining 1/2 teaspoon sea salt in a small sauté pan over low heat for 2 to 3 minutes, or until the garlic mellows and softens. Set aside. 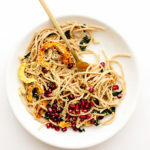 Quickly prepare the pine nut parmesan. 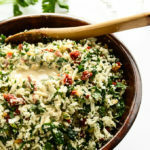 Add the pine nuts, nutritional yeast flakes, and a pinch of sea salt to a small food processor and pulse several times, or until ground into a texture that resembles coarsely grated parmesan cheese. Do not over-process, or you'll end up with pine nut butter. 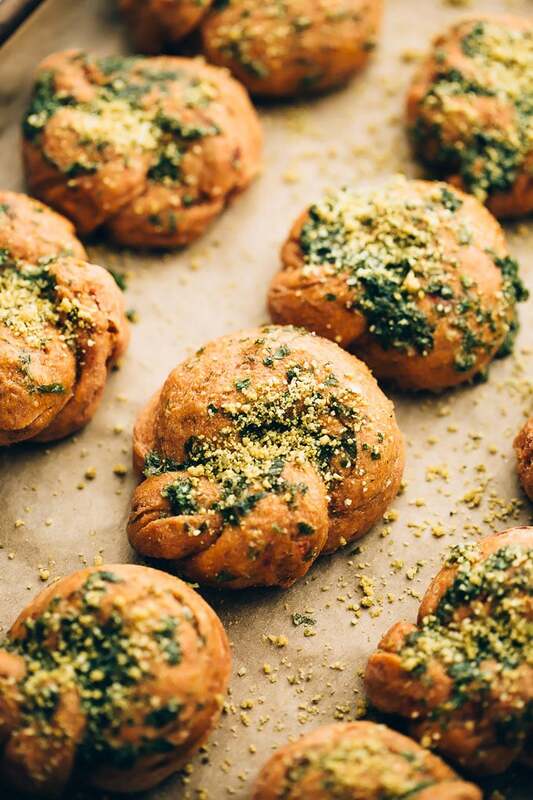 Brush the tops of the baked knots with the garlic-parsley oil and sprinkle with the pine nut parmesan. 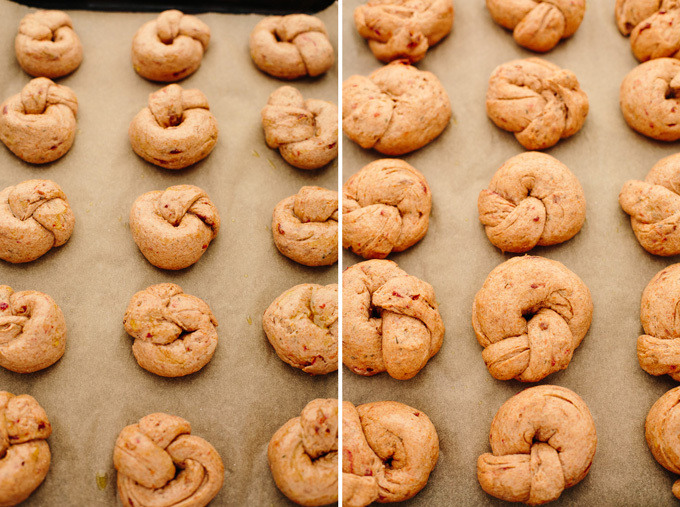 The knots are best served warm from the oven. Ohh I love that you added sweet potato to these, they look amazing! I don’t think I would be able to stop eating these beauties. Not that I’d want to. I see a star next to spelt flour but cannot find the note! Can u also use regular flower? Whoops! Ignore that! Will delete in a minute. You can use white spelt flour instead (will likely need a touch more), but I haven’t tested the recipe with regular all purpose flour. These are soooo delicious! Just made them, easier than I expected. Lots of flavor and great texture. I will be making these again soon. All this looks so good! 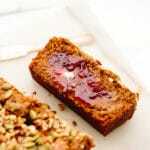 Do you have nutritional information for your recipes? Thanks, Kristina! I don’t have nutritional information (please see my FAQ page for why) but there are lots of great calculators online that you can drop post links into and they’ll calculate for you. Hi, Barbara! So glad you’re enjoying the recipe. Please feel free to link back to it in your round-up!